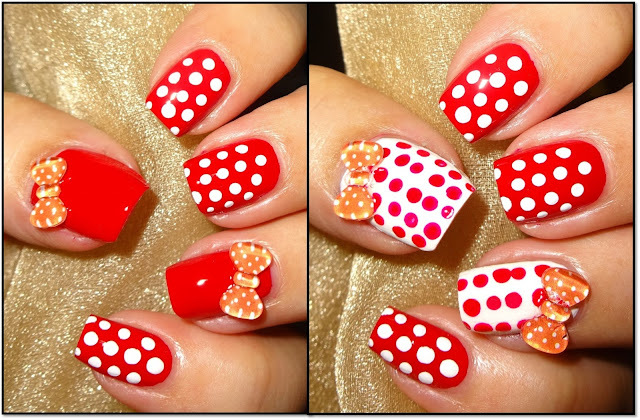 It's a spotty polka dotty kinda day with hot red nails (Nails Inc Charing Cross) embellished with 3D bubble nail decorations from Sparkly Nails. The Red Polka Bow nail charms are flat backed, I attached them while my top coat was still wet, however nail glue will be a more secure option. The Red Polka Bow 3D nail decorations currently costs £1 for 2. Available at Sparkly Nails who have an huge range of nail art items; they offer a loyalty and an affiliate scheme, go sign up, I have, you may as well save as you spend!